The Q200/HE digital recorder can be used as either a Holter monitor or looping Event recorder and is designed to facilitate ambulatory cardiac monitoring. Monitoring patients with the Q200/HE assists in diagnosing, treating and observing those complaining of palpitations, syncope, chest pains, shortness of breath or those who need to be monitored to judge their current cardiac functions or reactions to treatment. Data obtained with the Q200/HE digital recorder is analyzed by the Holter LX Analysis Software. LX Analysis allows for full review of all the ECG data recorded during the Holter test, including all normal, ventricular, supraventricular, paced beats and more. Language options include: English, French, German, Italian, Spanish, Polish, Portuguese and Turkish. Ergonomic Design – Large, easy view LCD screen, soft-keys and a very simple user interface make the unit exceptionally easy to use. Low Cost, Shielded Cables – The QRS patient cables provide better signal integrity and noise immunity while the low cost drives down the total cost of ownership. Combination Recorder – Use as a 14-day Holter recorder or 30-day Event monitor. Accurate and Reliable – Patient data is encoded on a memory card so no information confusion will occur. Reliable digital technology is used throughout recording to enhance service life and lower costs. 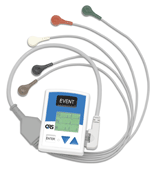 Maximize Reimbursements – The Q200/HE allows for “capturing” reimbursement of current procedural terminology allowed for Holter and Event. At the same time, removable digital storage allows for rapid re-deployment of the unit to another patient. Paired with the Q200/HE™ combination Holter/Event recorder, our software reliably captures and analyzes holter data. It is available in 5-User Levels – Basic, Enhanced, Enhanced Plus, Pro and Remote. Please download our Holter LX Analysis Matrix for specific capabilities of each level of software. Proprietary algorithms for enhanced QRS Detection accuracy.